(HARLINGEN) – On December 1, Texas State Technical College Chemical Technology alum and lab assistant Monique Jeudy will celebrate her anniversary with the college. The 43-year-old graduated with an associate degree from TSTC in 2017. For Jeudy, college did not happen immediately. She is the mother to three girls, and the oldest was born immediately after Jeudy graduated from high school. So Jeudy put college on hold and worked odd jobs – Taco Bell, Cinemark and other office work. She even did medical billing and coding for her family’s home health business for nearly a decade. Jeudy began her journey at TSTC in the Fall of 2015 nervous and unsure how she would do, especially as the oldest student in her class. The Harlingen native would assist her classmates if they needed help and would sit with them to encourage the completion of their homework. Her goal was to have everyone graduate together. She succeeded. 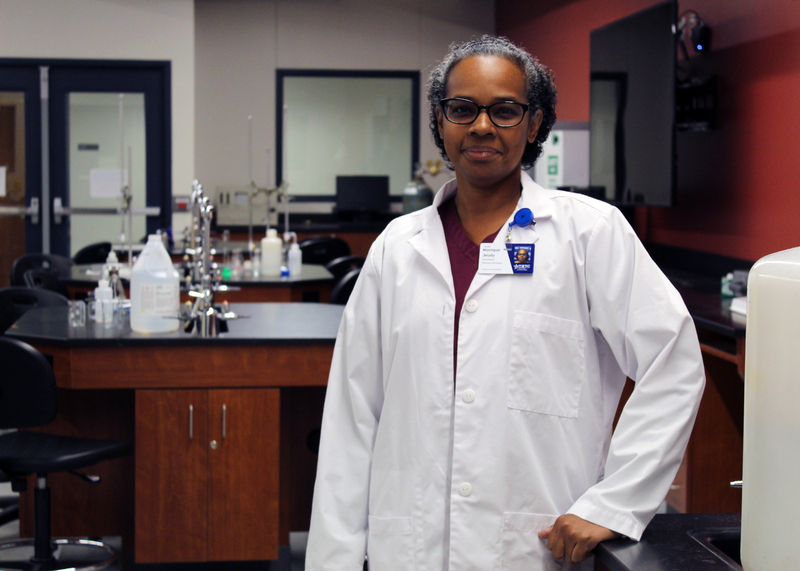 Jeudy even served as the president of the Chemical Technology Club. All of her experiences as a student, she said, prepared her for her current position as a lab assistant. She said her job is rewarding and after completing a recruitment presentation at her alma mater – Harlingen High School, she said everything for her has come full circle. Jeudy said she is thankful for the opportunities that TSTC has given her, as a student and staff member. And although she already feels accomplished, she is eager to keep moving forward for herself and her daughters. Jeudy’s middle daughter is about to complete her first semester at TSTC and Jeudy is also completing classes at the college so she can begin working toward a bachelor’s degree. She said she eventually wants to find a job in the industry as a plastics researcher, to create plastics using renewable and biodegradable resources. For more information on Chemical Technology, visit tstc.edu. Registration for Spring 2019 is underway. The deadline to register is January 2.